After a whole week of the bad flu thingy, I am still struggling to feel normal again (Symon - hold off on the comments about me not being normal anyway!). It was really nice today to get back into everyday life again, playing with the kids, visiting the library and grandparents... all those normal everyday things that we can so often take for granted. I now have a new appreciation for everyday life. Funny how it's only when something is taken away from you for a while that you really start to appreciate it. I was so excited today to pick up a book I had ordered from our local library (they bought it just for me!). 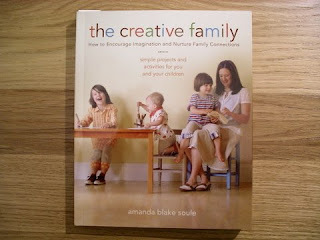 It is "The Creative Family" by Amanda Blake Soule. I have been visiting Soulemama's blog for quite a while and have enjoyed reading about her everyday adventures with her family and her crafty creations. The thing I love the most about Soulemama, is that she is not ashamed to enjoy her family and be proud to be a mum. I remember a time early on in my parenting days when I would be asked, 'What are you doing at the moment? ", and I would often reply with, "Oh, I'm just a mum". My view of motherhood has changed dramatically since then. I am now fiercely proud to be a mother, and like Amanda Soule, treasuring every moment of enjoying life with my kids and inspiring and encouraging them to do the same. So I am definitely looking forward to reading her book and getting some fresh ideas for creative time with the kids. way to go kristy. i reckon being a mum is the most understated career ever! I received this book as a gift and LOVE IT!!! I am proud to be a mom! Okay, I am soooooooo coming to you for mum lessons! This book looks great, I'll have to hunt it down.